Nikken Space Design has brought an unlikely partner on board for an amazing wedding chapel project: a kimono designer. 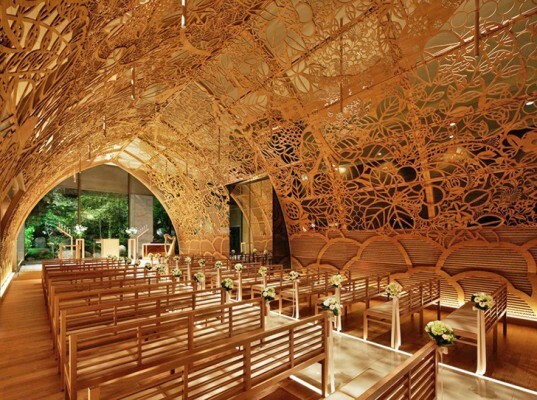 By relying on Japanese kimono designs, the architects of the this hand-carved wooden ceiling found a way to bring not only nature, but also revered Japanese traditions into this unique wedding chapel. 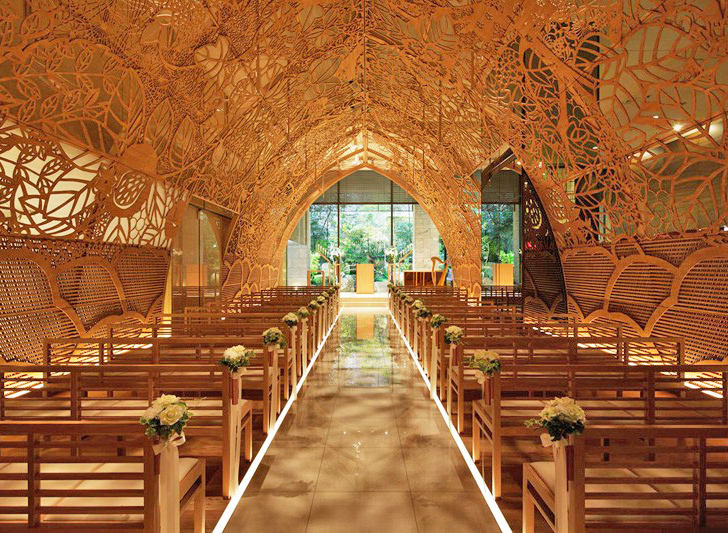 Visitors to the chapel will need to travel to the Ana Crowne Plaza Hotel in Hiroshima, Japan. There, they’ll find a steel-arched dome, measuring 6m (20 ft) high and 19m (62 ft) long. The interior ceiling of the dome is laced with latticework made from Japanese cypress. In its entirety, the chapel is comprised of 100 large hand-carved wooden panels featuring tree motifs that were illustrated by a kimono designer. Carvings of trees and leaves are not only meant to create a soothing atmosphere, but also to lend a poetic meaning as well. The hand-carved design features the roots, trunk, and leaves of a single tree, meant to provide wedded couples with the heritage of ancestors as well as best wishes for the future. The intricate wooden lattice that stretches across the walls and ceiling is intended to inspire thoughts of the forest. Because the wood is left its natural color, as opposed to being covered in paint, this goal is achieved more easily. The leafy shadows cast on the chapel’s floor, most noticeable in the aisle, work a step further, leaving a visitor uncertain of whether they are still inside a building or have ventured out into the woods. Images via Nacasa & Partners. Hopeful visitors to the chapel will need to travel to the Ana Crowne Plaza Hotel in Hiroshima, Japan. There, they’ll find a steel-arched dome, measuring 6m (20 ft) high and 19m (62 ft) long. The interior ceiling of the dome is laced with latticework made from Japanese cypress. 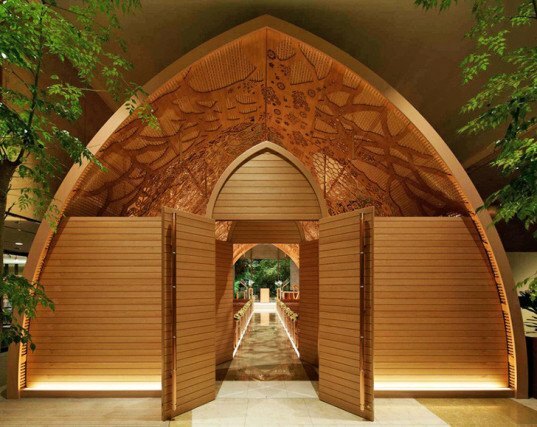 In its entirety, the chapel is comprised of 100 large hand-carved wooden panels featuring tree motifs that were illustrated by a kimono designer. The intricate wooden lattice that stretches across the walls and ceiling is intended to inspire thoughts of the forest. Because the wood is left its natural color, as opposed to being covered in paint, this goal is achieved more easily. The leafy shadows cast on the chapel’s floor, most noticeable in the aisle, work a step further, leaving a visitor uncertain of whether they are still inside a building or have ventured out into the woods. Because the wood is left its natural color, as opposed to being covered in paint, this goal is achieved more easily.